In the world of fast changing technology, Artificial Intelligence (AI) and Machine Learning (ML) are the front runners in creating the next disruption. Integration Wizards is at the forefront of understanding the potential of these new disruptive technologies. Team Estrade had the opportunity to speak to the man at the helm, Kunal Kislay, Co Founder and Chief Executive Officer, Integration Wizards. Following is an excerpt of this interaction. Kunal Kislay is a graduate of the prestigious Indian Institute of Technology – Bombay, with a degree in Civil Engineering. After working in hi-tech industry for more than 10 years, he co-founded Integration Wizards in 2014. Kunal started his stint with enterprise mobility back in in 2006 when smart phones were still struggling to break free from the notion of a communication device and establish itself as personal computing devices. 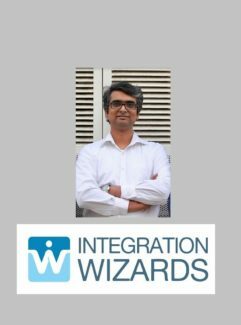 Before starting Integration Wizards, Kunal was the chief integration architect at Antenna Software responsible for the conceptualization and execution of customer enterprise mobility solutions. He has overseen the deployment of over 50 enterprise mobile solutions in various capacities which have included mobile applications across several verticals like life sciences, pharma, consumer goods, finance, healthcare, Oil and gas, Transportation etc for back office systems including SAP, Siebel, Peoplesoft, Oracle EBusiness suite, JD Edwards etc. Tell us about your professional journey and into the world of start-ups? Integration Wizards started off as a product based company in Enterprise mobility. Our enterprise mobility platform – Silverline, based on Microsoft Azure, is a complete solution allowing our customers to build, deploy and manage their enterprise mobility initiatives. Silverline was an instant success and we were able to onboard several Fortune 500 customers with thousands of users in the first couple of years of our operation. In the first few years of our operation, we were able to establish Silverline as Saleable and Secure enterprise mobility platform, open in its architecture and simple in its design. As it is said – “Success is a progressive realization of a worthy goal”. After having integrated mobile devices, we realized we did not need to stop at that. Silverline 2.0 goes beyond mobile devices and talks about “devices” or “things” in general. It is a major leap in our product architecture to enable seamless integration for devices of any kind using modern as well as legacy communication protocols. With Silverline 2.0 we venture into the world of Industrial IOT. We are working with one of the largest energy automation providers in the US towards this. For a company of our size we are very proud to have one of the top 5 pharmaceutical companies, the world’s largest building product and integrated security provider, one of the largest energy automation providers, world’s largest alcoholic beverage manufacturer, world’s largest office solution providers in our portfolio. Share your insights on Integration wizards, the company you founded, and the changing landscape of your industry? Integration Wizards operates in the areas of Enterprise Mobility, Industrial IOT and Machine Learning. These fields are constantly agile in their requirements. The ecosystem consists of multiple devices with varying levels of intelligence and we have constantly evolved, often ahead of the changing times to provide what is required by an enterprise. Our readiness towards change can be explained better through elaborating how we are bringing about change across industries through our product and solutions. Silverline 2.0, our flagship product is a platform that supports connected devices for enterprises. It is a complete Cloud platform based and built on Microsoft Azure with the ability to build native/cross-platform/hybrid mobile apps and supported across iOS, Android and Windows platforms. Silverline 2.0 extends its solution to support industrial devices in order to communicate, control and automate them. Comprehensive IOT Solutions by Silverline. IOT Solutions that address low level integration with sensors and edge devices over industrial protocols like MODBUS/CANBUS/OPC etc. Ability to interface with actual sensors for e.g. ones that measures temperature, pressure, vibration, etc. A lot of these sensors still communicate via legacy communication protocols like MODBUS/CANBUS/OPC etc. Our solution supports these protocols to get data from these sensors. Comprehensive Integration with Cloud components, Dashboard, Asset management and Integration with IOT Suite. Our solution is comprehensive and caters to most of the requirements of an IOT solution. This includes having a cloud platform and user configurable dashboard. Ability to manage and configure customer assets (Compressors, Oil Wells, etc). The solution further extends to the machine learning suite to interactively predict future failures. State of the art data lake to support millions of records infused every second. With a flood of data points that is generated by an IOT system, it can receive millions of records in a single day. Our solution provides a comprehensive store to be able to insert and retrieve data from these systems and to further leverage it through AI Machine Learning. Integrated predictive maintenance and Natural language processing. The solution can predict future failures by looking at failure trends from the past. With natural language processing we further enable end users to have seamless communication with the solution. What is your geographical range? We have global operations with many clients in India, United States and Europe. Silverline is currently used in 16 countries and 6 Languages by over 16,000 users on a daily basis to enable them to perform business critical activities. What is the size of your market of operation? Both in India and abroad. Integration Wizards has notched up several milestones within a short period including an established Enterprise Mobility platform hosting over 16000 enterprise users from across 16 countries. The company today has to its credit several Fortune 500 companies using their products and solutions. Integration Wizards also has a global partnership with Pega Systems to support them with their Enterprise mobility customers. What is your marketing strategy? For each product segment. We have adopted an organic marketing approach for our business. We have secured many clients due to the strength of our technologies and our solutions. While we are looking to scale manifold from here, our journey till date has been through word of mouth referrals. What are your views in the competitive marketing sector in start-ups? There is a lot naturally happening in the startup segment in India as it is in most countries. There is a lot of competition as a result. We believe that companies should look at long term inclusive growth rather than focusing on short term gains. At Integration Wizards we have been focusing on this quality and it has been the bedrock of our growth strategy. Do you target specific industries? The company’s solutions are industry agnostic. However most of their tractions have been with Pharmaceutical and manufacturing industries till date. Is the eco system in India ripe for your business to flourish? We believe India provides an amazing mix of experts, technical talent and infrastructure for technical start-ups like our business. While Indian companies in general have been slow in adopting cutting edge technologies, I nevertheless believe it has been changing gradually. In fact, in my interactions with several CIO’s in India in the recent past we can observe an increased technology adoption and a change in thinking towards thinking more product rather than service. How is the future of Big Data, Complex machines and AI for Integration Wizards’ business model? We are future ready. Our business model enables us to adapt fast and therefore stay ahead of the changing technology curve. Our solution is centred around enabling connected devices which can ingest large amounts of data. Naturally, Silverline is designed to deal with “Big Data”. Technically our solution hosted on MS Azure infrastructure uses the IOT Hub from Microsoft as its listening service which can easily support a throughput of millions of messages flowing in a short span of time. The storage is a complex data lake that helps deal with varying data formats that can be analysed with easy. The Solution further supports natural language processing to enable users to “talk” to the system. Our AI Engine enables building models that enable intelligent predictive maintenance. What would you advise to fresh entrepreneurs, especially women entrepreneurs on starting a business, a start-up in the cut-throat competition of IT sector? What home work they need to do, before they start scouting for investors? In my opinion a start-up should aim at solving a problem and to do that it is crucial to first clearly identify the problem. One should be on a start-up journey only if they are convinced about the imminent need for a solution to the problem. After having identified the problem, the next job is identifying the team that can solve it. Choosing the right people who believe in the idea and are convinced about the need for a solution, is crucial. It is always the team that solves problem and not an individual. As a founder one has to ensure that the team has enough runway to solve the problem. The initial estimates both from the timeline and cost are almost always inaccurate. It is important to adjust and course correct during the journey. Keeping a check on unnecessary expenses is crucial as well for a startup. Women entrepreneurs need to be as good as their male counterparts while juggling with their various commitments. While they are increasingly breaking the glass ceiling they might find it difficult in the starting stages when they have to take care of multiple elements ranging from team building to admin to finance to registrations and much more. It pays to take the help of experts in such cases supported by a well-planned road map to guide you every step of the way. What tips would you give to women, especially mothers for work life balance? I believe, the trick lies in being able to effectively compartmentalize home and office into different segments and live completely in the moment. When at office, give it your all, while when you reach home, try to completely switch off from office and pay attention to your family. As the old saying goes, ‘it takes a village to raise a child’, these days you won’t have the luxury of people to take care of your children. But now you have technology to help you. Maximize the use of technology to ensure you are in touch with what is going on with your child. Whether it is about having an app that shows the live feed of your baby’s creche or being a part of a parent’s WhatsApp group to know the latest happening in your child’s school. And also, though tempting, never ever get on a guilt trip about not being able to give more time to your family, because being a successful career woman is an equally important part of your identity as being a wonderful mother. Your views on demonetization and how it has benefited or hurt your company? Demonetization is an important step to mainstream the economy and root out illicit cash stash hoarded by some. It has had no impact on our company as almost none of our transactions is in cash. Which product segment is the highest revenue earner for your company? Enterprise mobility accounts for over 75% of our revenue. Our IIOT business has been picking up quickly and in the last one year has scaled from 0 to 25%. We simply expect good infrastructure and effective governance. I do not believe that the government needs to support or nurture any particular ecosystem. All that needs to be done is to create a conducive and fearless environment for business. What is the biggest challenge faced currently by your industry of operation? Most of our customers are in the US and Europe. The tightening of Visa norms both in US and Europe makes it difficult for us to effectively handle overseas travel. We are currently bootstrapped with an annual revenue in the region of USD 1,000,000. We are going to continue investing in IOT to make Silverline 2.0 more robust and inclusive of various device types. We will launch another major updates to Silverline to make the IIOT platform inclusive of intelligent preventive maintenance though the use of machine learning. We also aim to continue to grow and double our workforce by the end of 2018. Long term, over the next 4 years or so. We plan to establish ourselves as a major player in enterprise mobility globally, providing an end to end solution from visualization, design, development to management and support. We plan to work with major energy automation providers globally to enable them to provide a more robust and intelligent technical solution. In the next 5 Years we plan to have at least 1M industrial devices running on Silverline 2.0.